Edel Assanti is pleased to present Yoghurt Weaver, an exhibition by Mauro Bonacina. With this new body of work, Bonacina presents a game of delirium metaphor and aesthetic and functional re-evaluation. The exhibition's title,"Yoghurt Weaver", is a slang term referring to someone who performs a purposeless task, since yoghurt can obviously not be weaved. The series undertakes an investigation into the dynamic nature of language and its limited ability to convey meaning within the context of artistic production. The works in Yoghurt Weaver take the form of assemblage sculptures, comprised of a combination of found materials and purposefully sourced mass-produced objects. They conjure a myriad of art historical references, largely garnered from the artist's own personal experiences playing a variety of roles within the art world. The allusions are at times self-evident, as is the case with Lost in Space, a work comprised of hundreds of deflated helium balloons, mimicking the shiny sensibilities of Anselm Reyle, whilst inferring an artistic come-down from the heady, luxurious optimism of Koons' Celebration series. Employing an antagonistic and at times humorous perspective, Bonacina draws the viewer into a balanced critique and fetishization of the formal aesthetics, materials and mechanics of contemporary art. The titles play a role (House of Pain consists of a bird cage crammed full of squashed together stress balls) in, as Marcel Duchamp said of his practice of inscribing his readymades, "carrying the mind of the spectator towards other regions more verbal." However, frequently we see unlikely unities of objects through more formal connections, as Bonacina strives to eliminate preconceived aesthetic sensibilities through removing the boundaries of good and bad taste. Bonacina completed his BA at Cardiff in 2000, and his masters at Goldsmiths in 2003. In 2004 he was awarded the BOC Young Emerging Artists Award. 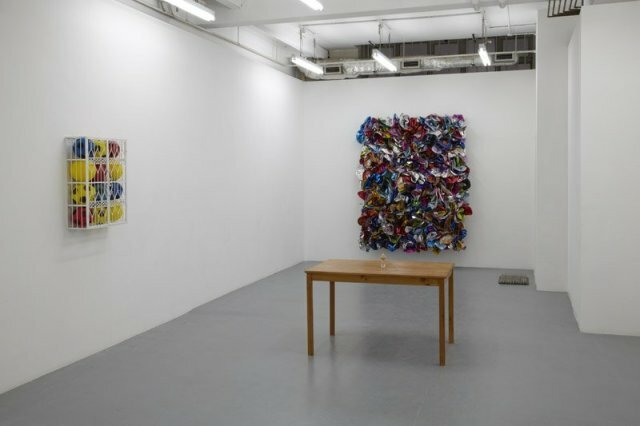 Recent solo exhibitions include Maria Stenfors, London (2011); Charles Bank Gallery, New York (2010); Lucie Fontaine, Milan (2010); Galerie Vera Munro, Hamburg (2006). Bonacina's work has been exhibited at Tate Modern, the Kreuzberg Biennale, Berlin, the Prague Biennale, and Saatchi Gallery. The artist lives and works in London.